Roxr Software, developer of Clicky Web Analytics, was founded in late 2006 in Portland, Oregon. Since then, Roxr’s product has grown to be used by more than 200,000 websites to track, monitor, and analyze traffic in real time. Partnerships with other web publishing companies and platforms have added an additional 500,000 users of this real-time web analytics solution in recent years, with some, such as Performancing Metrics (also known as pMetrics) and BlogFlux, licensing and rebranding Clicky as their own product. Clicky real-time web analytics software tracks web site traffic down to the individual visitor, along with every action or click they take on your site. Optionally, Clicky users can attach custom data to visitors, including user names and email addresses, and analyze each user’s full history. The visually oriented heat-maps feature include segmentation, and can be launched from the on-site analytics widget, allowing users to see how many visitors are on any particular page of the site. Clicky’s traffic analytics capabilities also include the ability to set up automated alerts for conversions, number of logged-in visitors, and other useful data, along with up-time monitoring that immediately alerts you if your site goes down. Other web statistics, such as video analytics, Twitter analytics, and Google search rankings history are also part of Clicky’s offerings, and the platform’s application programming interface (API) is available for developers too. 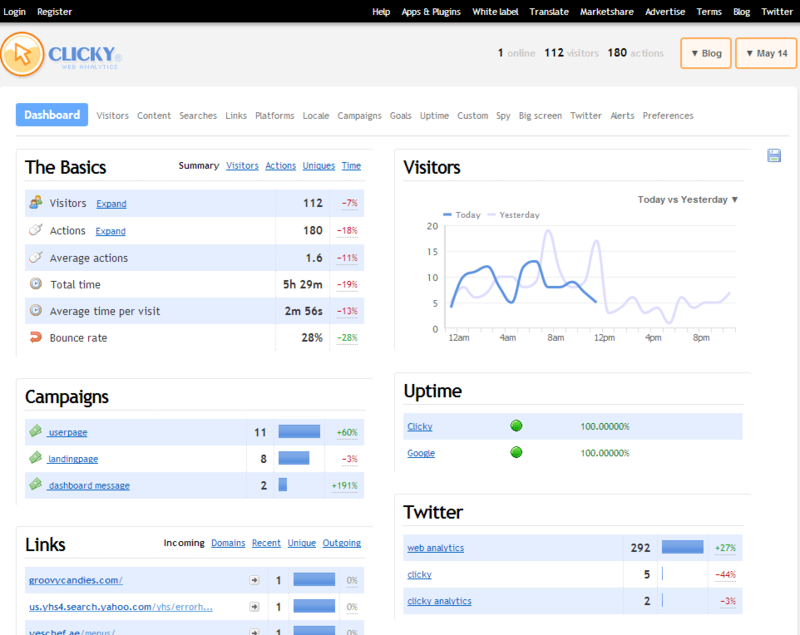 Clicky offers a free version for users with only one website and less than 3,000 page views per day. Custom accounts that can track up to 1,000 websites and 5,000,000 page views per day are also available. Learn everything you need to know about Clicky. Our experts will reach out to you shortly.